Periodically I may let you know about some camping & RV gadgets that I’ve come across that I use & like. First up on the list is The Grill Gauge. I’ve had a few devices that claim to measure the propane in your tank, including an inline gauge…. and a magnet you slap on the side of your tank that changes color according to the amount of propane in the tank. Both gauges technically worked, but the readings were unreliable at best. When I first had an inline gauge, it read that I was on the line between red & yellow. I decided to have the tank topped off at Camping World in Indianapolis while on our way to a weekend camping trip. After the tech filled it, the bill was just $9 & change. Expecting the bill to be in the $15 range, I asked him if he filled it, and he told me that it was already half full. So, that’s when started looking for something else. I picked up the magnet thinking maybe this would do the trick. Well, I’m not sure if it did or not. The magnet is a series of bars that change color as the propane level drops. But figuring out which column of bars you’re supposed to read was a little confusing and made for a lot of guesswork. Tanks (or cylinders) that propane dealers most often fill are identified as “20.0 lb. tanks” – the most commonly used tanks for gas grills, bug zappers, and patio heaters. The propane industry fills propane tanks by weight. 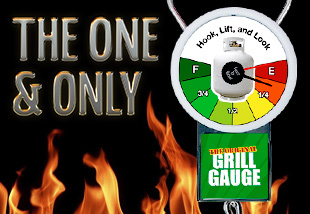 The Grill Gauge was engineered and custom calibrated to measure the “maximum allowable fill weight” of liquid propane for standard 20.0 lb. grill tanks. The “maximum allowable fill weight” (determined by DOT regulations) ranges between 18 1/2 and 19 3/4 lbs. of liquid propane per 20.0 lb. tank (depending on the tank’s water capacity). – Propane fillers must label their cylinders with the lowest amount of gas that might be in their cylinders, not the maximum allowed capacity. – A 20.0 lb. tank that is “filled” less than the “maximum allowable net fill weight” will show less than FULL on the Grill Gauge, again because the Grill Gauge is calibrated for the maximum allowable net fill weight!